PA amplifier products which Hylex produced are hard-wearing and reliable because they have to be able to work without interruption in aggressive environments. 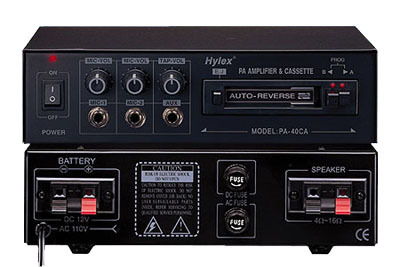 Hylex has a wide range of mono PA amplifier (Public Address Amplifier models from 10 watts to 300 watts, they can offer most suitable PA amplifier model depending on the size of audio broadcasting environment or area. Hylex’s new designed of Interchangeable PA amplifier system combines different purposes of previous amplifier models with the innovation. People with different demands have several selections which can fit their requirements by choosing different models from these PA amplifier series. The exceptional price / performance ratio of this PA amplifier series is very competitive that made it popular with users. With the exceptional quality, Hylex believes that its PA amplifier products will attempt your expectation. If you have further question about Hylex’s PA amplifier products, please do not hesitate to contact them.